When does a violin or similar instrument become “intermediate?” Well, after “entry level” you have to call the next level something. An “intermediate” instrument is better looking, but more importantly, it’s better sounding. The makers can pay attention to more workmanship details, they can use better looking wood, and they can spend more time on the inside construction of the instrument. Because they are still semi-mass-produced, I can offer many of these amazingly high-quality instruments for under $1000.00. The above discussion is continued after the instrument description. 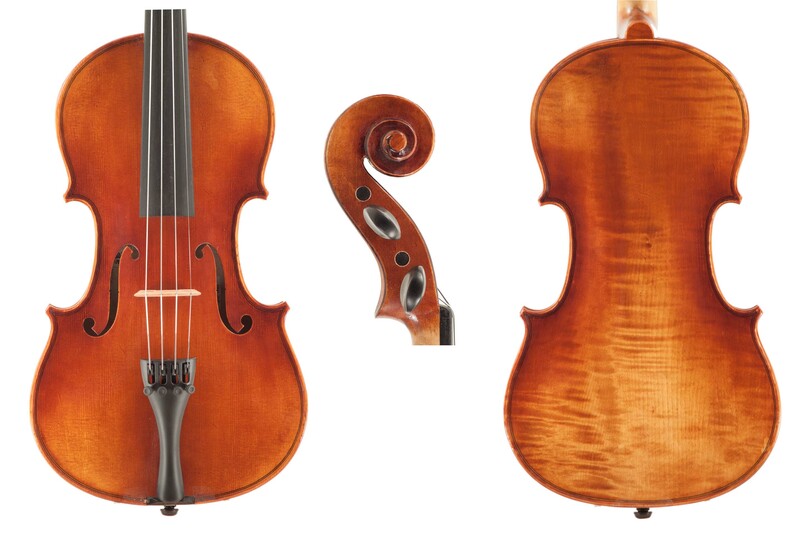 These violins were made about 5 years ago before Zhenjie Zhao decided to up his game and only sell higher grade instruments that have been antiqued or distressed to look old. Today’s product starts at $800.00. I was offered these violins as “rental-grade,” but they are far superior to what that means to me. Quality workmanship (or “work-womanship,” because if you look at photos of Chinese violin workshops the majority of the workers seem to be female), beautiful materials, strong sound, and unbelievable consistency. I bought 26 of these violins and they all look virtually the same. My principal supplier of strings and other various instrument accessories, Connolly and Co., has decided to delve into the instrument world. They couldn’t have chosen a better line of instruments than those from Revelle. The four violins in the line are made in China and set up in their US workshop. 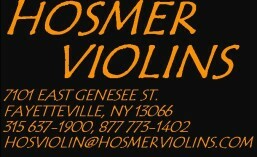 They receive a final setup here at Hosmer Violins, usually getting a new bridge, new nut, fingerboard planing, and neck refinishing. All the violins are coated with oil varnish. The principal difference in the quality levels is the wood and the refinement of the sound. The top instrument is tastefully antiqued and compares very favorably with other instruments in its price range. Pictured to the right are the lowest model 500 and the top model 700. 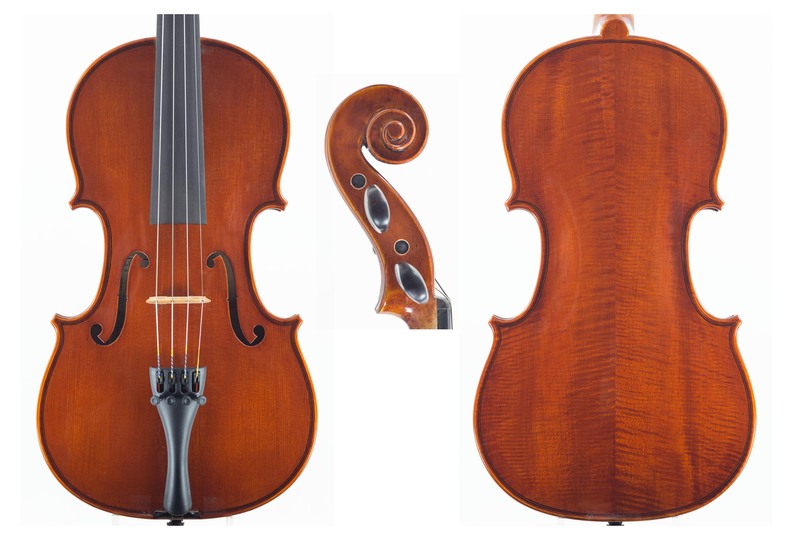 In my quest to find good sounding violins just a notch above an entry level price, I sometimes get very lucky. A rep from one of my suppliers brought these instruments one day last year. They were set up with usual factory strings, lousy bridge, etc. I played one and was not impressed. “Wait,” said the rep; “I’ve got one in the car that was set up by a luthier.” The difference was night and day. These instruments have turned out to be among the best sounding $500 violins in the shop. That experience just goes to show how important it is to seek your instruments from a real violin shop, not general music stores and the internet. The Hua Yin violins feature moderately flamed maple and a very thin varnish, but it’s the sound that will really impress you. The violin pictured features a shaded varnish which is no longer available. The current finish solid dark reddish brown. When I have the time I’ll take a new photo. Yuan Ji supervises the workshops of Eastman Strings. Instruments from this shop are of very high quality, and are usually sold with other trade names like “Andreas Eastman,” “Jean-Pierre Lupot,” “Pietro Lombardi,” and many others. “Samuel Eastman” instruments are their entry-level products that we used to sell labeled “Chan Lee.” They also sell German-made instruments as mentioned above, and Romanian-made instruments labeled “Ivan Dunov.” Many different models of viola (Stradivari and “Tertis”) and cello (Strad and Montagnana) are available as well as Stradivari and Guarneri model violins. After our meticulous setup and adjustment you won’t find a better value anywhere. These instruments are made, some models anyway, in conjunction with Xuechang Sun and C.L Wynn. The violin pictured at the right is the $800 instrument. It features very solid workmanship, nice simple wood, and a tastefully shaded thin varnish. This violin, and the more expensive models above it, and great sounding instruments for their respective prices. Currently available are models 220, 320, and 420. These are a notch above my entry level—and they’re a few notches above most other dealers. You will not find a cleaner made instrument for under $1000 from any other workshop—in fact, all of the makers on this page should learn how to shape necks from Mr. Sun. They make all grades of instruments (up to $10,000 cellos), but there are no shortcuts in the manufacture of even the least expensive. The dark durable varnish is thin but transparent so you can appreciate the often highly flamed wood underneath. His next level instruments are the same bodies with hand applied oil varnish. This workshop, in Mudan Jiang, is the largest maker of higher-grade instruments in China. Most of the time they are labeled with various trade names from whatever wholesaler they come from. 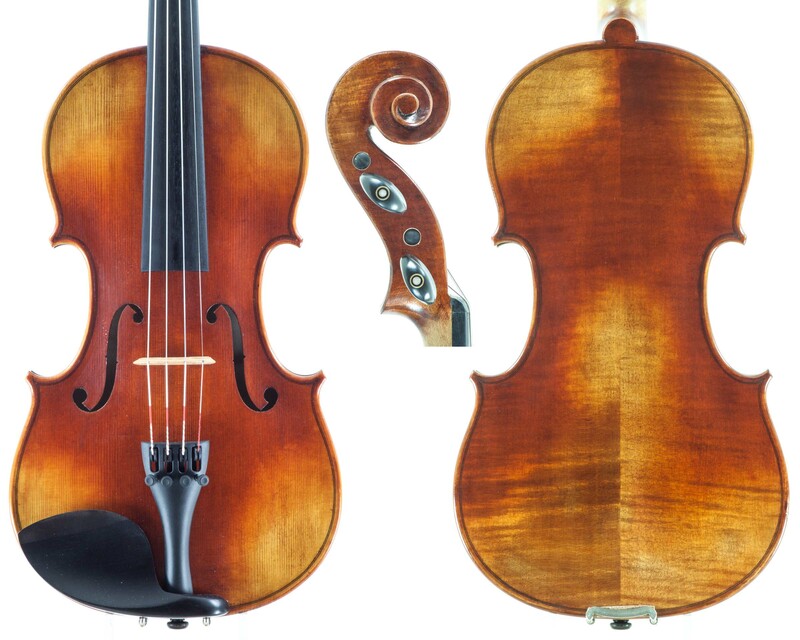 Often they are sold “in the white” and completed and varnished by violin shops or other wholesalers. I have been selling these instruments since 1994, and they feature the nicest wood and the cleanest workmanship of any instruments in their price range. The pictured instrument is from 2002. I thought it was time to improve on the fuzzy photo from 10 years ago (shot with a point and shoot camera), and I especially wanted to show the Italian style arching. Fortunately I had a previously sold violin in for adjustment. Only a few dings in a 14 year old instrument isn’t bad. I first became acquainted with the work of Zhong Long Sheng when I bought instruments from Chicago String Instruments about 14 years ago. The instruments, bearing many Italianate trade names, were made in the shop of Mr. Sheng. The best instruments were brought to the US “in the white” and varnished here. I bought many of these better instruments, opened them up, graduated the plates, replaced the bass bars, and turned them into great advanced student instruments. That was then. Now Chicago String Instruments is no more, and the company that bought them changed manufacturers for their Italianate trade named instruments. Mr. Sheng sold his instruments through another company, but since they never visited my shop, I never got to see an up-to-date product. Now he has changed suppliers again and the instruments are easily available. There are many different grades; the one pictured to the right is the lowest grade. Very solid craftsmanship at all levels. The wood gets better looking as the price increases. Often marketed as “Snow” instruments, I prefer to use the master’s real name. All of the instruments feature a characteristic “antiqued” look, especially the highest grades which are distressed to simulate age. But it’s the sound that is most impressive. Also, European tops are used in the better models—the best of both worlds. These instruments are made in a small workshop in Romania. All-European wood and workmanship insure a quality product whose tone will mature with vigorous playing. The instruments that are varnished in Romania are tastefully shaded but not antiqued. The higher level instruments are varnished in China and are fully antiqued. The wood is thoroughly aged to produce a stable instrument that will serve many generations. A small workshop in Beijing, they produce some of the best bargains obtainable. 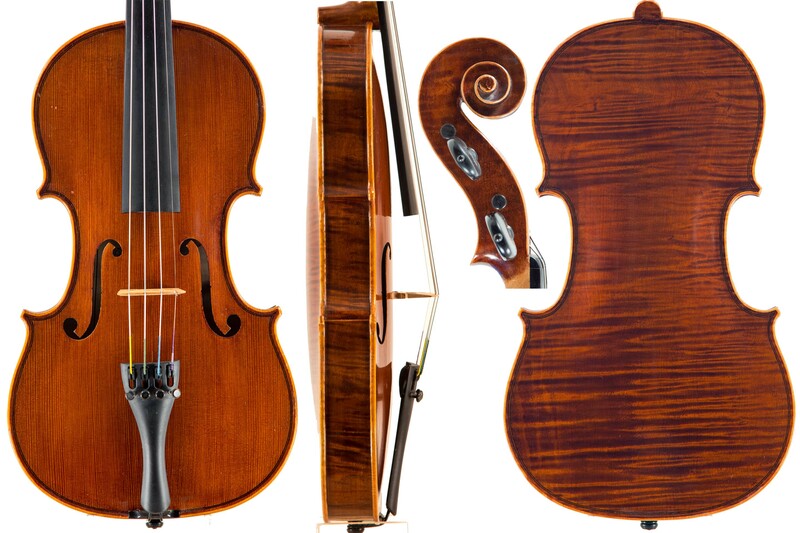 Strad and Guarneri models are available in violins. 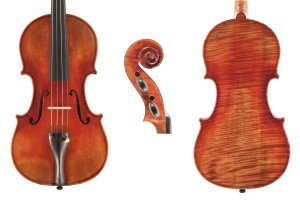 Their violas are wide models capable of the deep, dark viola sound that usually can’t be obtained for a mere $1800.00. These instruments are no longer available, but I have a few left. Callegari instruments are made in three grades. Camillo Callegari’s are made entirely of the highest grade of Chinese wood. The Ettore Callegari’s feature European spruce tops, while the Salvatore Callegari’s go all the way with every part made with European wood. Why do I carry (mostly) the cheapest models? It’s because the sound is not that much different from one model to the next. It’s a testament to the quality of the Chinese wood, and a further testament to the expertise of the makers. It’s also because I cherry-pick only the best of the bunch when the rep visits my shop. 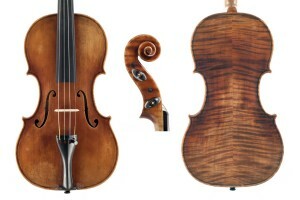 The “Heritage” violins, selling for $1200.00, are the same violins but with lesser grade wood and a non-antiqued finish. 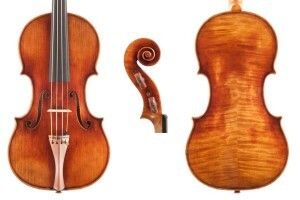 Most of the violins are Guarneri models, as pictured to the right, providing a rounder and more narrow upper bout for more comfortable playing. 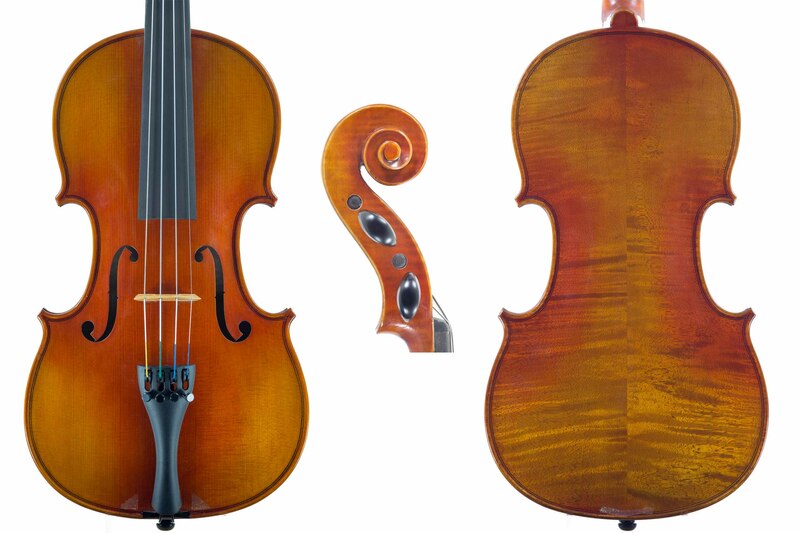 There are also Stradivari, Guadagnini and Amati models. The maple is very highly flamed, and the varnish is tastefully antiqued. Great looks and sound for the money. 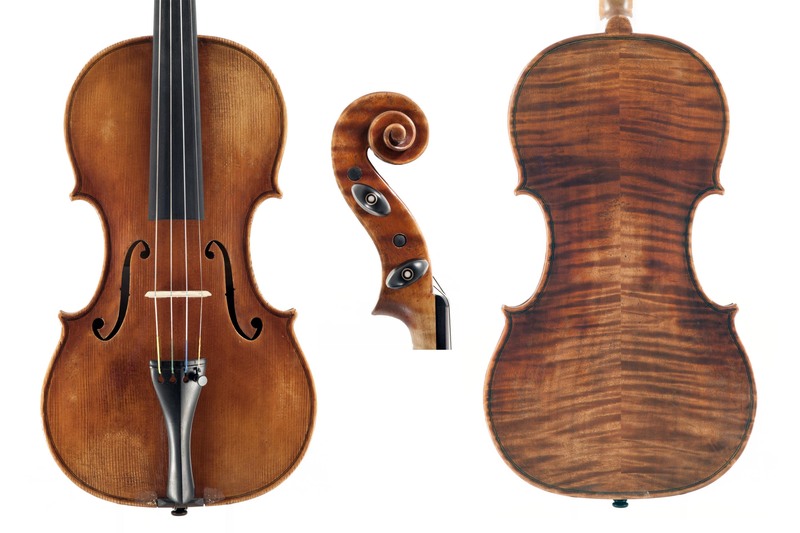 In addition, they have just begun selling a higher grade violin labeled “Ignazio Emiliettti,” which is a master-made instrument a cut above all the others selling for $3800.00. Another small workshop producing very high quality instruments. They make a few grades, the best of which are all European wood. The varnish is tastefully antiqued, without any real distressing. But the sound is what these instruments are all about. European wood, Chinese workmanship. Unfortunately for all of us, Ming-Jiang died recently from cancer at the young age of 56. His heirs are continuing his legacy of fine instruments. Gliga has many workshops in Romania. His best price-point instruments are in the middle—from $1000 to $1500. In this area the wood is very high quality with lots of flame, and I prefer the “antique” varnish, although it’s really not “antiqued.” In our shop we reshape the necks in addition to our regular setup. Once these violins have been exercised, they produce a powerful sound. 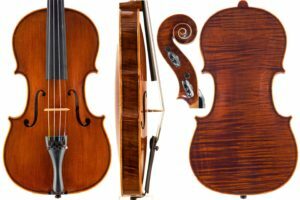 Some of the most appealing violins and violas come from the shop of Sam Shen, one of the few establishments in Shanghai making high quality instruments. The varnish is tastefully shaded, revealing beautifully flamed maple underneath. Some interesting small viola models. All of the instrument workshops represented are the cream of the crop. Most of them send their representatives to my shop so we can hand pick the instruments and bows. The instruments they make are based on old Italian models. The violins are not oversize, as many student instruments were only a few decades ago. Another advantage to these new instruments is that the necks are attached at the proper angle—a problem that often has to be corrected on older instruments. They use first class materials for the fingerboards and pegs, and, for the most part, the instruments are made entirely by hand. The wood is the best available for this price range. The spruce tops are even-grained, and most of them feature highly flamed maple backs and ribs. However, let’s not confuse the amount of flame in the maple with anything but looks. There are great sounding old Italian violins made of wood more reminiscent of a stair tread than of fine instrument wood. 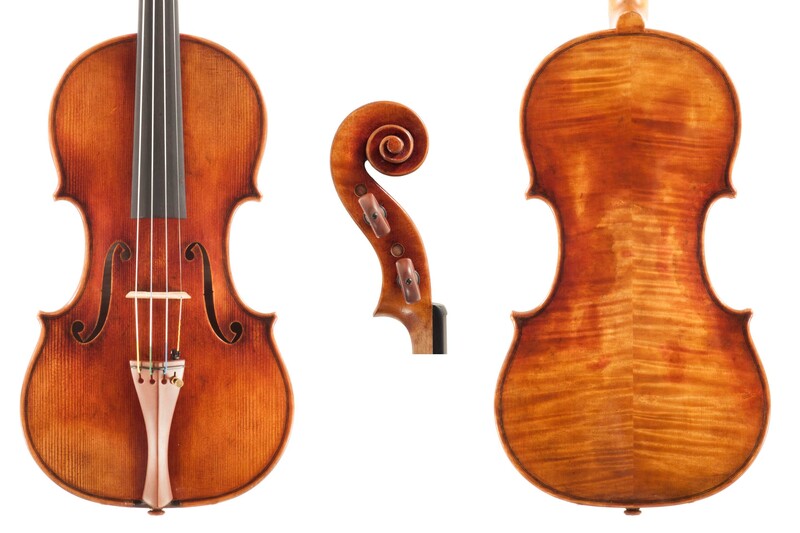 Amati and Stradivari only used highly flamed wood when they developed a clientele that could afford and demand it. Flame has nothing to do with sound—it has only to do with trying to emulate the look of the great Cremonese masterpieces. Where the wood comes from, what its stiffness and density is, and how it is dried is far more important than how it looks. European wood is stiffer and denser than most Chinese wood (of course, sometimes it’s too dense and too heavy, but that’s another story). Entry level instruments made with softer Chinese wood often have a quick response and a dark tone with less brilliance as you go up the e string, however they are very easy to play and require no “break in” time. Under the ear they have a “big” sound. They are perfect for the beginner, as you don’t have to work very hard to get the sound out, but they can’t be “pushed.” Entry-level European instruments are often made with the heavy, dense wood that is inappropriate for any instrument, and the sound suffers as a result. Good European wood (and the best Chinese wood) features a balance of stiffness vs. density that produces an instrument with more potential. Even when new, these instruments offer far more tonal color and power than their entry-level cousins made with lesser wood; and with months of vigorous playing the instrument comes alive and sounds far better than when first set up. Also, let’s not forget about varnish. There is no secret here—hand applied varnish that has been tastefully shaded or antiqued greatly enhances the look of a student instrument. At this level lacquer and synthetics are abandoned and the spray gun is usually put aside for the brush—a longer process, but more pleasing in the end both for looks and for sound.